Arlescote is a small hamlet with only a mere handful of houses and farms and it is really a hidden part of the county. The main feature in the hamlet is Arlescote House, a Grade 2 James 1 house of architectural and historic interest. 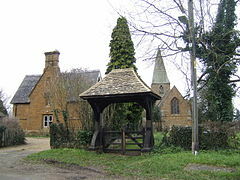 Ratley is a village of true delight and prides itself on being the oldest and highest in the County at some 660ft above sea level and lies on the north/west side of the Edge Hill escarpment. The village has developed in the form of a long low loop, with houses built of yellow ochre ironstone quarried locally, all appearing to shelter each other. The remains of a 12th century Motte & Bailey castle are just outside the village, close to Manor Farm. The parish church was built of local stone in the 14th century and is a church of traditional layout and with fine acoustics. It is one of a few churches in England dedicated to St. Peter and Vincula. In the church is a book where people with the surname of Ratley can sign their names. The former Church of England School on The Green and the First Post Office on Church Street are still standing, but have been converted into houses. 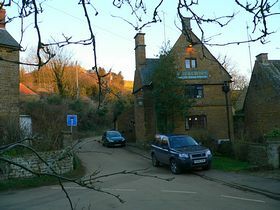 The village has a public house The Rose and Crown, and it is very welcoming to walkers. Parts of the pub are reported to be 900 years old and it is also a Grade 1 Listed Building. Ratley Village Hall in Chapel Lane was built in the 1930’s as a barn conversion. The Benefactor was Lord Bearsted of Upton House. Edge Hill is an escarpment and hamlet which stands at the top of a richly wooded hill and affords a wonderful viewpoint over the Warwickshire countryside. The hamlet gave its name to the first battle of the English Civil War. The narrow wood on the scarp of Edge Hill, in the south/east overlooks the lower slope and the plain on which the battle was fought on Sunday 23rd October 1642. The battle was fought between the Royalists forces of King Charles 1st led by Prince Rupert and Olivier Cromwell’s Parliamentarian troops commanded by the Earl of Essex. 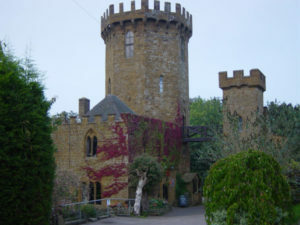 Radway Tower (now part of the Castle Inn) marks the site where Charles 1st standard was raised before the two armies clashed. The two armies of similar size, approximately 12,000 men, continued for 2 days with neither side gaining a decisive victory. The hamlet has a public house, an eccentric building of local Hornton stone called the Castle Inn, with an interior that features beautiful stone fireplaces, exposed stonework and lots of paintings which was built in 1740 to the designs of Sanderson Miller (1716-80). Radway is a beautiful and classic English stone village built around Radway Grange and lies below the Edge Hill escarpment. The earliest known record of Radway is in the Doomsday Book of 1086. In medieval times the lands around Radway were divided between Arbury Priory and Stoneleigh Abbey. Radway Grange and the gardens, in the heart of the village was originally built as an Elizabethan gentleman’s house by the world renown architect and designer Sanderson Miller, who during the 18th century lived there for much of his life. There are to be found in the village two duplicate ‘wind-up’ audio visitor’s guides. Notable things to see are the ancient cart wheel wash, the earlier site of the medieval church, the Radway Primitive Methodist Chapel in West End (now a private cottage) and the Radway Meadows Nature Reserve. The ancient parish church was demolished and some of the stones together with some interesting features were used in the construction of the present St. Peter’s Church. They include some memorials re-set from the old church together with the 15thcentury effigy of a priest, the effigy of Captain Kingsmill who fought for Charles 1st and died in the Battle of Edge Hill, and the effigy of the architect Sanderson Miller who died at Radway. The Battle of Edge Hill exhibition is permanently installed within the beautiful Church of St. Peter’s and this building is a fine example of Gothic revival architecture built in 1866.